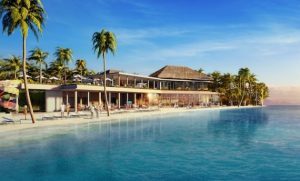 Male (Maldives) — December 19, 2018 (travelindex.com) — S Hotels & Resorts, a subsidiary Thailand’s Singha Estate PCL, will showcase the cultural charm and diversity of the Maldives as part of its most ambitious development to date and the first phase of the Crossroads Maldives integrated leisure and resort destination. “The Maldives is a truly beautiful destination — a tropical island paradise where guests can fulfil their vacation dreams. But there is more to this enchanting country than just sun, sea and sand. The Maldives has a rich history that has been shaped by its unique maritime location at the crossroads of different cultures. The facilities that make up Phase One of Crossroads Maldives will encourage guests to delve deep into the diversity of the destination, whilst also embracing the country’s exquisite natural beauty,” commented Dirk de Cuyper, Chief Hospitality Officer, S Hotels & Resorts.